Well, as anyone who has read my previous posts I have been trying to increase the mileage (with limited success) to at least give me a feel of how difficult my challenge will be. My previous attempts had been to aim for St Mary’s Lighthouse or Blyth which are 19.5/24.5 miles respectively and to be picked up my ‘support crew’ (Mrs B in our car). Both attempts ended in mechanical failure at Tynemouth (16 miles), which meant I ended up waiting for rescue at Woods Cafe (which I can thoroughly recommend now). 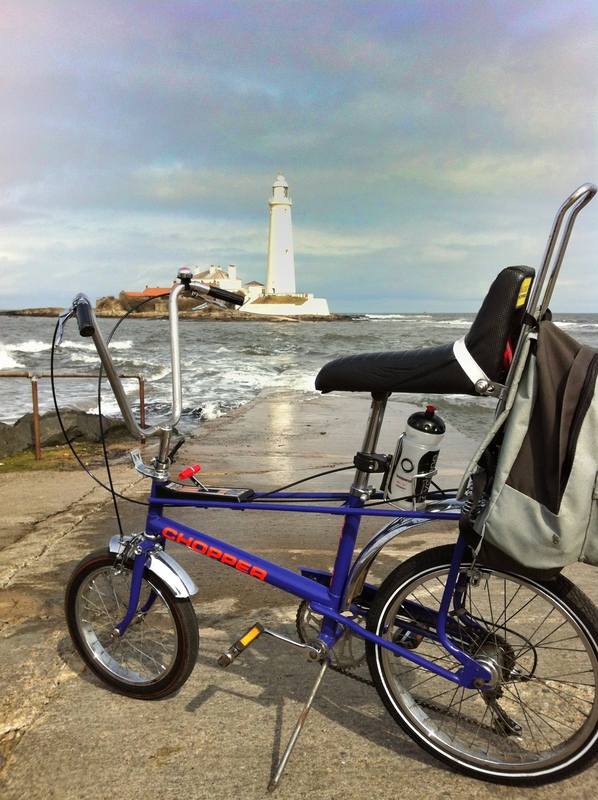 This time was going to be different as the bike would have the recent modifications in place – I was aiming to reach St Mary’s Lighthouse and … RETURN!! The weather forecast was decent so I loaded the bike rack into the back of the car (just in case) and I headed off in the direction of the http://www.thecyclehub.org/ where I knew the bike jumble would be starting at 10 and I had arranged to meet Jed as he cycled down from Slaley on his Giant Defy (somewhat of an unfair advantage me thinks). Sitting outside having my tea and there were loads of cyclists coming in. A large group of cyclists came in and one came over with his helmet, shades and Zorro mask on and started to talk to me – I recognised his voice and bluffed my way thru to when he removed his disguise. It was Dave Nichol, a colleague from work who I hadn’t known was into his cycling but apparently he’s relatively new to it and loving it. The Hub were preparing themselves to show the Paris Roubaix race in the afternoon on a big screen so there was quite a buzz. A guy came in on a Dawes Ultra Galaxy (same as my tourer) but I noticed he didn’t have the Brooks leather saddle on. I went to question why and it turns out we’d chatted 2 years previous whilst doing the Northern Rock Cyclone 107 miles ride -he was on his Dawes and I was on my Trek Madone 4.7 (but wishing, for comfort that I was on my Dawes). Anyway turned out he (John) did LEJOG the year previous to me so we did email a couple of times before my attempt and he followed my progress on my blog. But now he was much more interested in my crazy capers on the Chopper and was I think surprised at just how much attention the bike was getting. It was a good catchup John if you get to read this feel free to drop me a line. Anyway, I tore myself away after another pot of tea (cheers Jed) and off to the track to lead me down to Tynemouth. I would leave the track where I knew there was a lot of broken glass which Newcastle Council hadn’t cleared and was impossible to cycle around it. When I rejoined the track I started catch what turned out to be a father, mother, their son and another friend all on traditional old style tourers. Just turns out they had been at the Hub also and had been admiring the Chopper. The other friend turns out to own 60 bikes and one of which is a penny farthing which he’d like to do lejog on – and people say I’m mad?? good luck to you. Anyway we made our merry way down to Tynemouth without incident until, without warning, a dog not on a leash ran across in front of me so I slammed on the brake to avoid it and the father on the tourer ran into the back end of me – bringing chain etc off – OH NO, THE CURSE OF TYNEMOUTH STRIKES AGAIN – this time though I was able to don the fashionable latex gloves and fix the problem and head my way along the coastline to St Mary’s Lighthouse (photo evidence below). again I stopped for a cup of tea which I drank whilst watching the waves lapping over the causeway – very pleasant but with a cold easterly wind. So now I was at my halfway point (19 miles) I ‘just had to’ retrace my tracks. Incident free and bumped into John and a couple of female friends who he’d met at the Hub and he’d been telling them all about my Chopper – they probably didn’t believe anyone could be so crazy – they do now!! Eventually arriving back at the Hub and this time well deserved large muffin and a pot of tea – really should have treat the Chopper also. 38.56 miles done at an average of 9.4mph – which isn’t bad going. This entry was posted in Uncategorized and tagged leather saddle, mechanical failure, paris roubaix, transportation, trek madone. Bookmark the permalink.